Fanatics of previous Philippine National Police (PNP) boss Director General and now Senatorial applicant Ronald "Bato" Dela Rosa are as of now eager to watch the motion picture which dependent on his biography. Robin Padilla, who depicted Gen. Bato in the motion picture titled "BATO" shared some photographs of him with the performing artist who goes about as Mayor Rodrigo Duterte. The generation group picked the veteran performing artist Efren Reyes to depict Duterte when Dela Rosa was as yet moderately aged police. 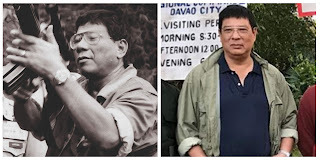 It appears that Reyes truly attempted to impersonate the looks of President Duterte amid his more youthful days, wearing a coat and furthermore copying his hands in pocket motion.